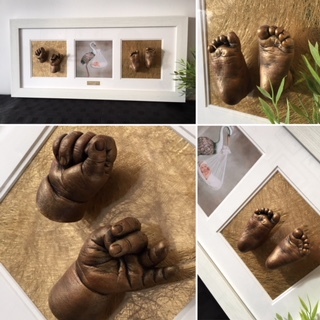 Can I have my baby lifecasts reframed? 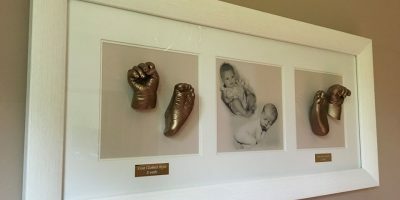 When you have casts taken and you choose a frame, it doesn’t have to stay like that forever. 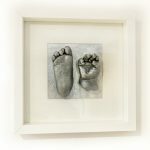 Have you had a new baby and would like to update your original casts to match your new addition? No problem at all. Fletcher had his casts taken four years ago. 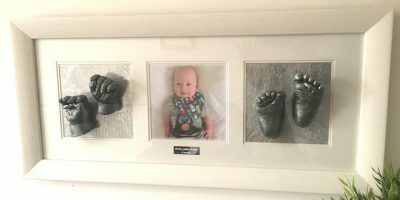 His frame no longer matched the decor and his little sister had now arrived so it made sense to give Fletcher an upgrade too. 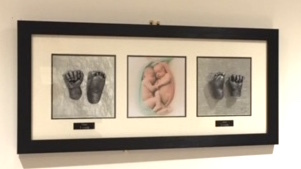 This little brother (bottom right) came to have casts created just as his big brother (top right) had. Now the brothers have new matching, luxury white frames. 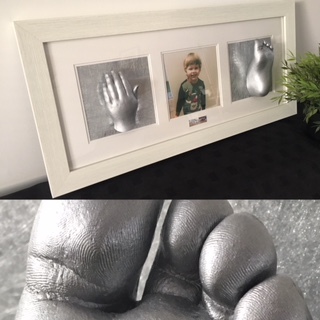 When this little brother arrived he too wanted his casts taken, but mum didn’t want too many frames on the wall. So we reframed both into one triple aperture frame. 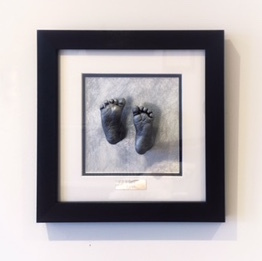 Offering an affordable frame that complements your casts. 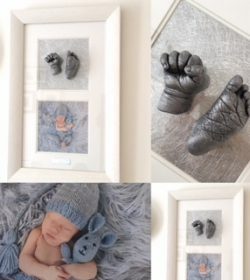 Can my casts be repainted? If they are damaged I can repair the damage and repaint so it is virtually invisible. I cannot change the finish without losing the original detail. Do I have to have the same size as original frame? I'd like to chat to you first, can I do that? Of course. Get in touch HERE or text or call 07837800353 Happy to have a chat and explain all the options available. If you originally chose a single aperture frame, maybe now you’d like to upgrade to a triple aperture. Do you prefer a touch of luxury in life? 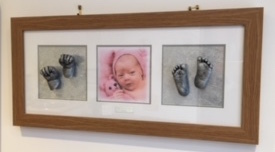 These frames are handmade to order by a local framer, they are of a superior quality material, and the finish sets off your very impressive casts perfectly. The glass is stronger and more durable than the standard option – built to last. 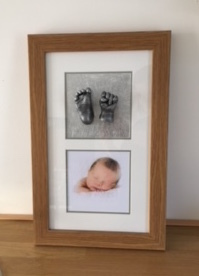 You can choose from – Oak effect, Silver, Black, Flat White, Bevelled White and Distressed Gold. Each option can come in a Single, Double or Triple Aperture. 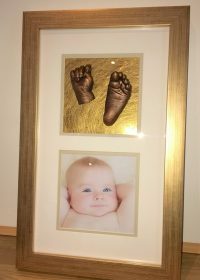 Upgrading or reframing to a luxury single aperture frame? Can I supply my own frame? No sorry. 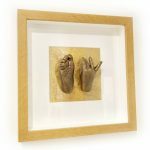 Not all frames and glass are suitable for life casts. If you don’t see a style you like, please ask, I may be able to source what you are looking for. Why is Silver dearer than the rest? It costs more to make. I'd like a style that I don't see here - can you help? Probably yes. 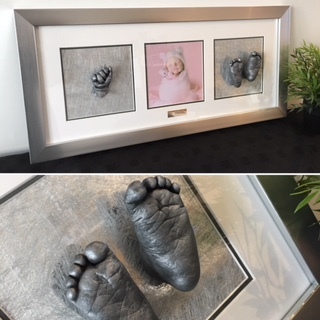 Always welcome to get in touch and I’m happy to help create a bespoke frame for you. 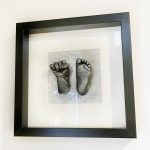 Upgrading or reframing to a luxury double aperture frame? Upgrading or reframing to a luxury triple aperture frame? If any part is broken or chipped off, keep it safe. 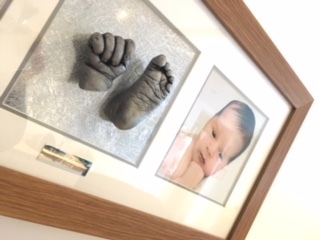 Make a booking with me and return your casts to me and I will do what I can to repair them. Depending on the amount of work & time involved will determine what charge there is. Please do not attempt to fix them yourself as this can often result in making it more difficult for me to then properly fix. Ask first…send me photos…I’m happy to advise and help. If broken glass is involved please remove the casts from any broken glass before bringing them to me. Talk to me before you attempt to do this. 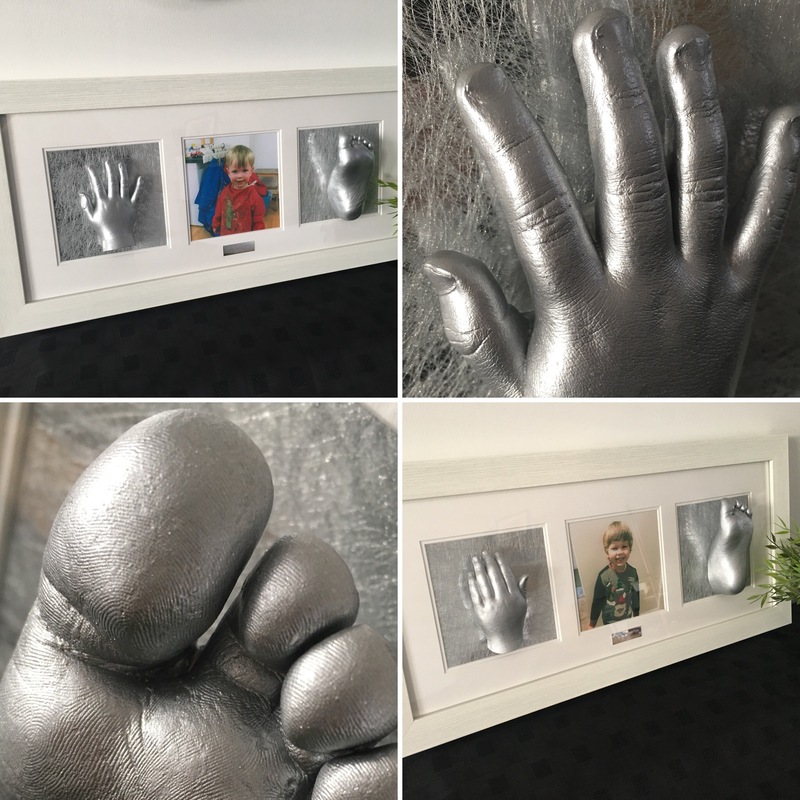 There are loads of options for you to choose from when it comes to reframing your casts, whether through choice or necessity…I’m happy to create any of the options you see here or equally happy to discuss something unique just for you. Use the buttons below to contact me directly, find more answers or head back to my home page. Look forward to speaking to you again soon, have an impressive day! ← Online Shop: What’s changed and why?